We frequently use this space to discuss issues related to nursing home mistreatment and other forms of elder abuse. Our Northern California elder abuse law firm believes that talking about these issues will help to bring the problem out of the shadows. Increasing awareness can help prevent future cases and can protect the victims, in part by encouraging people to report suspected cases of elder abuse. The latter goal includes helping victims themselves to speak up; a goal expressed in the title of a San Bernardino campaign “It’s Not Your Fault,” a moniker that recognizes that shame and embarrassment keep victims from speaking up. 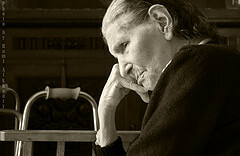 Families can experience significant stress as a family member ages. Stressors include an elderly relative moving into a household and the financial burdens of care. Affected family members may take this stress out on the aging relative. Family history plays a role with some cases involving the persistence of existing abuse or even a formerly mistreated child or spouse “turning the tables” on an abuser whose health is failing. Social isolation can be one warning sign that family stress had turned into abuse. Additionally, family members may unintentionally fail to provide adequate care, constituting abuse (even if it is non-willful) threatening the relative’s health and safety. Combined with other stresses in the caregiver’s life, the stress of caregiving can be a trigger for abuse. Added stress can result if cognitive issues cause the elderly person to act aggressive towards the caregiver. An untrained caregiver may result to physical force as a way to manage difficult behavior. Neglect can also arise from a lack of training and resource limitations. A caregiver’s financial dependence on the patient can also lead to financial exploitation. Guilt and other factors may keep a caregiver from seeking help that could alleviate stress and prevent abuse. Abuse may be perpetuated by societal views that keep people from intervening in a “private, family matter.” Cultural beliefs, including beliefs about gender roles, may also influence family dynamics and lead to abuse. Other social and cultural norms may keep an abused individual from reporting the treatment. Educating people who work with the elderly about cultural differences can help them recognize when behaviors cross the line and become abuse. Some abusers fit our image of true-life monsters. Others do not. This post discusses some factors that may turn an “ordinary person” into an abuser. These are explanations, NOT excuses. Elder abuse is wrong, regardless of the “why” behind it. We believe that increased awareness, including an understanding of some factors that lead to abuse, can help people identify abuse and protect the victims. If you believe someone you know is the victim of elder abuse, or if you are a victim yourself, please report it. A useful guide on reporting elder abuse in California is available on the Department of Consumer Affairs’ website. Our office is also prepared to advocate for the victims of elder abuse in San Francisco, Oakland, Sacramento, and surrounding regions. Our San Francisco elder abuse law firm promises to treat you with the sensitivity these issue demand while ensuring we protect the legal rights of elder abuse victims.